Samford University students studied the rise of the British state, the beginnings of Roman civilization (see group at ancient aqueduct), the food and culture of Costa Rica and a variety of other international topics during Jan Term 2013---all onsite. They traveled to the island of Saba in the Netherlands Antilles to study its physical characteristics and coastal reefs; visited London, Oxford and Cambridge to learn about the English Reformation, and experienced a rare snowfall in Amman, Jordan, while studying the Arab World. A total of 202 students and 20 faculty members traveled abroad for Jan Term courses in eight countries, according to Dr. David Shipley, Samford's director of international programs. The countries visited also included Peru, the Dominican Republic and Indonesia. "All this would not be possible without an internationally-focused faculty that is willing to do a lot of hard work and planning to share their passion of international education with our students," said Dr. Shipley. "It is but a very small step toward global citizenship, but our students have a much broader perspective for having studied abroad." Shipley noted that the number represented a 20 percent increase over the 2012 figure. "Studying the English Reformation in London brought the history to life," said student Bradley Patton, who enrolled in religion department chair Ken Roxburgh's course. "While I love reading books about history, visiting the places where the events actually happened takes it to another level." He mentioned Oxford and Cambridge, "the intellectual hubs of religious debate," and other sites such as Westminster Abbey, the Tower of London, Hampton Court and Smithfield Market, where religious dissenters were executed. Patton, who has also studied in Rome, Italy, thinks the emphasis and opportunities for studying abroad set Samford apart from other schools. Students in nutrition professor Patricia Terry's course cooked typical Costa Rican dishes with fresh ingredients from local markets and farms. They milked goats, assisted a sugar cane processor in making brown sugar and picked vegetables and fruit and caught trout that they ate for lunch. Student Shannon Evins found the course "dynamic and hands-on." She learned how to prepare such traditional Costa Rican dishes as cheese empanadas (pastry), patacones (fried plantains) and sopa con frijoles (black bean and egg soup). "We went to small, family-owned farms to see how all these wonderful ingredients are grown and nurtured." She also found that her Spanish "improved dramatically" in the three weeks she resided with her host family. 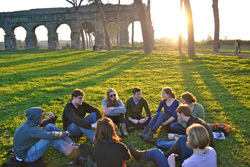 University Fellow Daniel Fox called the trip to Italy the "capstone" of his liberal arts education. "It is one thing to read about the history of western thought (but) quite another to see these phases of history unfold before your eyes," he said. Fox and his classmates visited the locations in which the Roman Republic and Renaissance were born, but Pompeii provided "the most intriguing site" of the trip. "Being able to walk along streets that have been perfectly preserved for two millenia in tons of volcanic ash gave me the goose bumps," he said. Political science department chair Fred Shepherd led the course on the British state. "It focused on how the British government has influenced the daily lives of its people over the past 500 years," said Dr. Shepherd. He felt the course was "a big success" because of the wide variety of sites the students were able to visit around London, from the Tower to the Thames Flood Barrier. Core curriculum professor Delane Tew and her class had a Birmingham-like experience when they were caught in the "once in a decade" snowfall in Amman. "As with Birmingham, everything shuts down with just a little snow," said Dr. Tew. They were forced to hold a class in their hotel by Skype rather at the Jordan Evangelical Seminary, as planned. But first, they walked to the local supermarket, "which thankfully was open," and bought hummus, pita bread, yogurt and deli meat for lunch.